A good working digestive system is crucial for nutrient absorption, health and wellbeing. With the obesity epidemic, higher instances of diabetes, and heart disease, indications are that we are doing something wrong, and the need to address it is absolutely necessary now! The entire digestive process begins when we think of food or see food especially when we are a bit hungry. Without realizing it we start the salivation process to prepare for the food that is to come. The first job of the mouth is to break down the food via the teeth. The second job is to use the saliva to begin the process of a further breakdown of food. This is accomplished by an enzyme called amylase. The longer you chew the food, the longer it allows the amylase to do its job. Acid is produced in the stomach. Between the acid and enzymes food is further broken down and made ready for the small intestines. The acid in the stomach also has the job of killing off bacteria and some viruses as further protection for the body. The small intestine is where most of the nutrient absorption takes place. 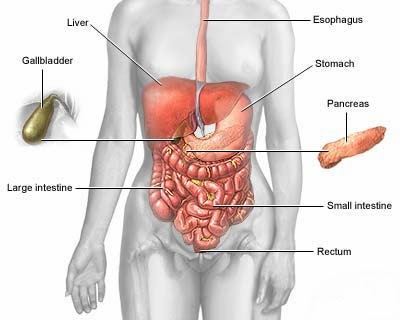 The pancreas helps by releasing enzymes and the gallbladder helps by releasing bile salts. The large intestine takes the remaining mass and extracts the leftover nutrients, the remaining water, and electrolytes for the body to use. Whatever is left is for elimination. If you don’t have sufficient enzymes for digestion then you can have a mass of food sitting in the stomach much longer than it should. This causes bloating and an uncomfortable feeling. It can then sit and ferment in the small and large intestine. Bacteria love this situation and feeds off of it. As a by product, the bacteria give off gas and this is also very uncomfortable. Unless addressed, the colon can get layers built up of muck and lays the person open to various diseases. At this point a person really needs to look at detoxing the colon, liver, kidneys and gallbladder. Taking medication may help somewhat in weight loss, but does not necessarily relieve the underlying problem. There are several different types of detox such as Hulda Clark method to detox all of these areas. Once detoxing has been done on these areas, prevention is a necessity, and possibly further body detoxing of various organs. - One way you can nip it in the bud is at the beginning of digestion, (the mouth) try taking a good digestive enzyme with your meals. - Also consider taking pro-biotics as this replaces good bacteria that may otherwise be lost from detoxing. - Electrolytes are also a good idea to keep hydrated. - A great way to start the day is to drink room temperature water with fresh squeezed lemon. This gives your liver a boost. - Fruits such as blueberries, raspberries, blackberries etc., are great for detoxing and cleansing the body. Not only do they taste great, but they have a lot more fiber in them than eating bran muffins. - Cranberries have lots of anti-oxidants, plus, bacteria doesn’t like it and will not survive well in it. - Broccoli and spinach and kale are some of the super foods with their superior vitamin and mineral content. Eat these several times a week and not only will it help flush the colon, it will also supply many nutrients the body needs. We live in a toxic environment and probably just about everyone may need a good cleansing inside to maintain good health. (Good health on the inside will show on the outside).